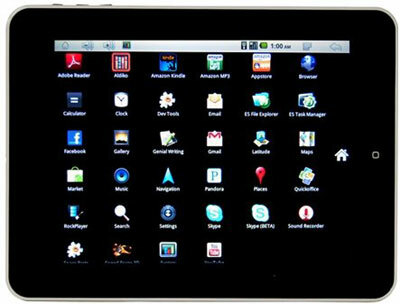 Here’s an interesting tablet that a reader came across and commented about on an earlier post, the Aiptek A8 Android Tablet. The Aiptek A8 is a budget tablet (it is currently $178 on Amazon) but surprisingly it comes with Android 2.2 and full Android Market access, which is rather unusual for a device without a camera. Instead it has the option to hook up a Aiptek camcorder via USB. For ereading, it comes with the Kindle and Aldiko apps pre-installed, as well as Adobe Reader for PDF files and Quick Office for Microsoft Office files. In addition to the Android Market, it also come with the Amazon App Store. There are a number of other apps pre-installed as well, including Pandora, Speed Forge 3D, Rock Player, YouTube, Skype, and others. It also supports Adobe Flash out of the box. As the name would suggest, the Aiptek A8 features an 8-inch display. Since it is budget, it uses a resistive screen and has a pixel resolution of 800 x 600. That is similar of the NextBook Next3. The Aiptek A8 is powered by a MX515 Cortex 800MHz processor and comes with 4GB of internal memory, with a microSD card slot for additional storage up to 32GB. For RAM it has 512MB DDR2. Other features include WiFi, two stereo speakers, microphone, 3.5mm headphone jack, and USB host support for using an external keyboard and mouse. The battery life is rated at 10 hours for web surfing and playing music, and 6 hours for movie playback. Given the feature-set and budget price, on the surface the Aiptek tablet looks like a pretty decent device for the money. If you’ve had your hands on one of these, please let us know what you think in the comments section below. No market access, but there is a hack. I was thinking about picking up one of the Cobys to review but never pulled the trigger. They’ve also got the 8 and 10 inch versions. I didn’t know there was a market hack; that changes things. The 8″ Coby has a resistive screen. The 10″ Coby with a capacitive screen looks to have similar specs as the one I linked to above except it still has Android 2.2. From the comments I have read on forums, people seem to be fairly happen with the Mid7022. I don’t think there are too many, if any, 7″ tablets with both a full USB port and a micro-HDMI slot. If the battery life is decent, it would seem to be the best under $200 market on the market. Long story short, I decided to pass on reviewing the Cobys. I think there’s going to be some stiff competition in the next few weeks (Amazon). I’m working on the reviews for a couple of budget tablets right now, the Pandigital Nova and Pandigital Planet :). I’m thinking the Amazon tablet is going to be pretty cheap too.